This massive sword is equipped with a 36 3/8" mirror polished stainless steel blade. The cast metal guard and pommel are constructed with a solid brass plating and historical engravings and symbolism which add elegance and collectibility to this one of a kind sword. Stretches 45 1/4" long and includes a hardwood display plaque. I was wondering why the box was so big when it arrived. After unpacking I could clearly see this is no toy. I can't even begin to explain the excitement in picking this sword up. Truly a beautiful piece. Now I knew this before purchasing but the only drawback I can see is the 2nd degree on it. Would have obviously liked the 3rd degree but still a beautiful sword. While this sword is a great display piece, there are some flaws that I saw upon opening the box. The metal of the handle framing the red velvet grip is thin, which caused a dent that upon relatively-close inspection is an unsightly flaw. Second, the decorative silver adornments (on mine, anyway) were crooked, like they had been haphazardly glued on (once again, terrible to look at). Lastly, the pommel, which looks relatively fine on its own, contains a red plastic disc meant to mimic a gem or crystal of some sort. This would've been a nice touch if the disc itself was made to fit in the hollow pommel, but it instead sits clumsily and rattles with the slightest movements. The blade, on the other hand, is pretty well-made and pretty to look at. It isn't sharp; in fact, it's completely flat-edged, but as a decorative sword, it's understandable. Overall, the blade is good enough to look at if you don't stare too closely at the obvious flaws in design, hence the 3 out of 5 rating. Not the best I've seen from this site, unfortunately. If the designers had put more thought into the whole of the hilt, it definitely would've felt more like it was worth $50. If you've got the money, I'd look for something else here, but hey, it's your decision. I have bought 2 of theswe swords, One for me and another for a Masonic Brother for a gift. extreamly satisfyed with Quality great value. Sword is better then I expected I've had high expectations in the past and got lead. This time I expected bronze and got gold! Beautiful sword. Great symbolism all over it. The plaque came with the right screws. It was common sense! Wow, what can I say about this sword? Well let's start off with, it's enormous! The blade is so big, it would barely sit on my table when I was taking pictures of it. The blade itself is breathtaking, it has a highly reflective mirror finish that is extremely unique, and like nothing else I've ever seen. 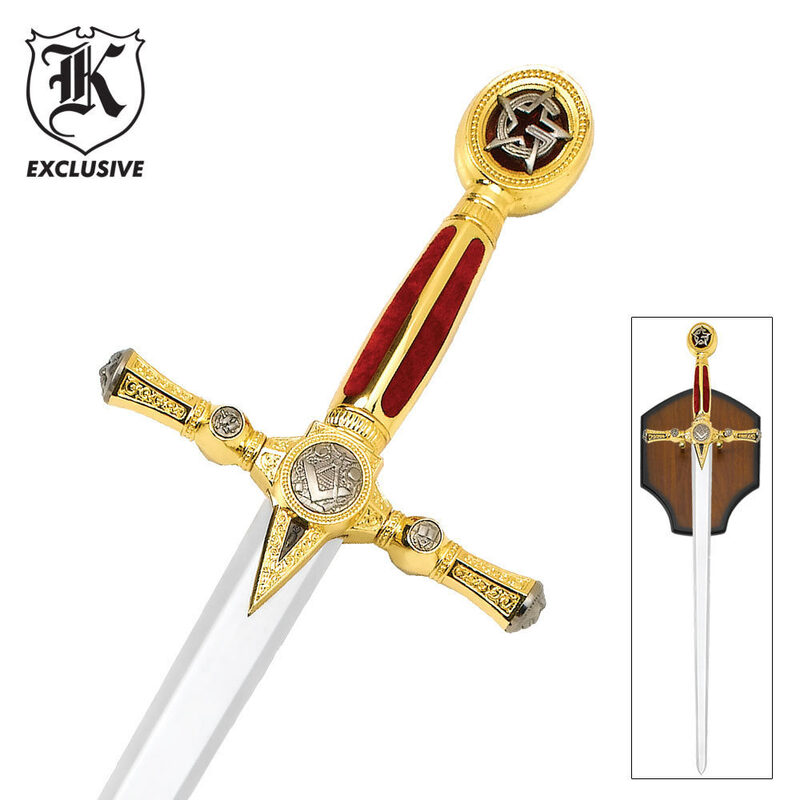 The hilt is a masterpiece, from the red velvet grip to the symbols of the FreeMasons adorning it. This is a masterpiece, and is easily the most jaw-dropping piece yet. I only have one teeny tiny problem, on one side of the blade, you can see the word "China" on it. But it's so small you really won't notice it unless your looking. This being a display piece, I'll just hang it with that side hidden anyway. That being said, I have yet to recieve a product from TrueSwords that has not just totally blown me away in every single way possible. You guys are the best!! The sword is even better in front of your eyes than in the picture. The felt handle is nice too! I didnt buy this sword but someone importent to me did. He passed away and i inherited the sword and when i found the place he bought it from i wanted all sword lovers to know this is a magnificent sword. The first time i saw it i couldn't believe how beautifuly this sword was crafted. It is something you would want in your collection. I have already summited one review on this item but I feel that I need to add another. 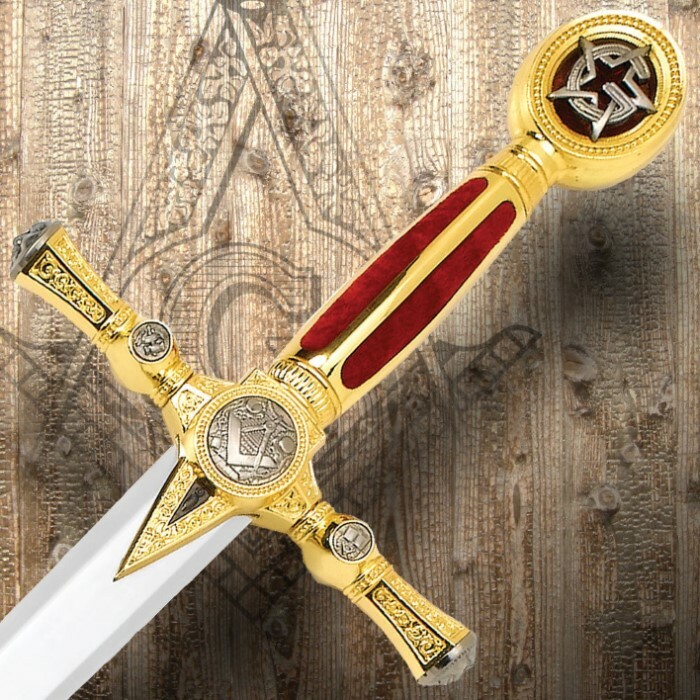 This sword is very striking, however the Masonic emblem is for the 2nd or Fellow Craft Degree just want everyone to be awear of this because you can not tell it in the pictures on the web site.